We specialize in premium quality diamond sawing and grinding blades. Including those for portable high-speed gas saws, and high power walk behind saws. Applications include concrete, asphalt, green concrete, masonry, granite and more. We also carry crack chasing tuck-point blades, coating removal, concrete grinding and turbo cup-wheel grinding blades. Our top suppliers include Milwaukee and Gang Yan / GY Diamond. We can also special-order items and save you money. PRODUCT DESCRIPTIONS: Saw blade variations include laser welded, continuous rim, segmented, concrete blades, green concrete blades, concrete profiling, concrete leveling, concrete cleaning, asphalt cutting blades, masonry blades, hard brick blades, block wall blades, combo blades, ceramic tile blades, granite blades, marble blades, counter top edging blades, tuck point blades, triple tuck point blades, sandwich tuck point blades, crack chasing blades, cup wheels, turbo cup wheels and more. 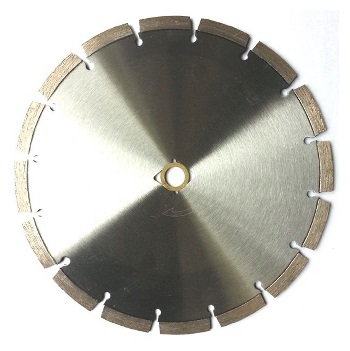 These blades are designed for dry or wet cutting and are ideal for cutting cement roof tiles, hard roof tiles, hard cement, and similar items. WARRANTY AND INSURANCE: Gang Yan Diamond Products blades are covered by $10 million product liability insurance and have manufacturers warranty against defect. Gang Yan Diamond warrants all of its diamond blades against possible defects in workmanship and/or materials for the useful life of the cutting segments. Laser welded blades are also warranted against segment loss due to weld failure. Determination of the applicability of the warranty will be made after the product is inspected by Gang Yan Diamond quality department. This warranty does not cover any product determined to have been used in a non-application accident or damage caused by operator abuse or misuse. In no event shall Gang Yan Diamond Products or Best Materials LLC be liable for consequential or incidental damages arising out of the failure of any product to operate properly. Read and understand warnings and instructions before operating any tools with these products. Operators AND bystanders must always wear ANSI Z78.1 eye protection, hearing protection and protective clothing. Operator and bystanders must aways use OSHA/ANIS approved respiratory protection suitable for the specific application. Make sure the wheel is not touching anything when the tool is started. Always let the wheel come to a complete stop before setting tool down. Do not operate in a combustible environment; sparks can be generated which could cause a fire or explosion. Do not touch or try to stop a moving wheel with your hand. Do not apply side pressure to the wheel, such as side grinding, or twisting or wedging the wheel in a cut. Blades are designed for maximum operating speeds. Do not exceed recommended maximum speed. Do not touch a cutting wheel immediately after use -- it may be hot. A 20% restocking fee is applied to all diamond blade stock returns. A RMA must be received prior to any return in accordance with our Terms policy.